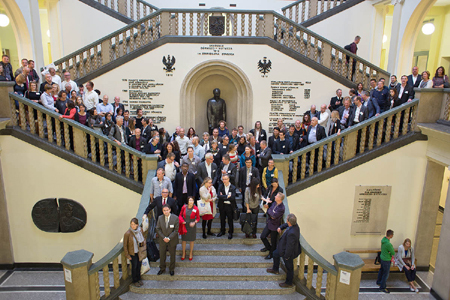 From 23-26 September 2015 the 9th International SedNet conference took place at AGH University in Krakow to which 130 sediment specialists participated from all over the world. In total 13 platform sessions, workshops and working group meetings were organised. Dr. Jasmina Obhodas, Ruder Boškovic Institute, Croatia, with the poster “Bromine in the delta of the Neretva River environment and increased bladder cancer incidence” (for abstract see “4. Posters, miscellaneous issues, poster no. 32”). 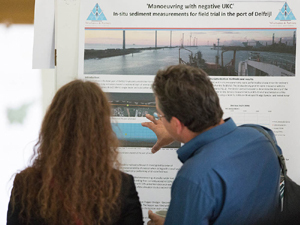 René Barth, Wiertsema & Partners, the Netherlands, with the poster “In-situ sediment measurements for field trial in the port of Delfzijl ‘Manoeuvring with negative UKC’” (for abstract see “4. Posters, miscellaneous issues, poster no. 39”). To get a quick impression of the outcome of the event we refer to the slides of the “Wrap-up” session at the end of the conference. For the abstracts of Presentations and Posters see the menu Downloads on this page. Pdf’s of most presentations can be found there too. Sediment quality and how society perceives it in terms of ecological and human health impacts may have a profound impact on sediment management strategies. This time the SedNet Conference welcomed approx. 30 contributions on sediment quality issues, from which 7 were platform presentations in the session “Sediment Quality and Perception”. The session was opened by E. Szalinska with the case study of the Detroit River (North America), a large and complex riverine system located in the Canada and US border area. Sediment contamination problems at this transboundary site are well known since the 80’s and a substantial effort has been put into sediment remediation actions. Although recent studies show no real change in sediment contamination after remediation due to anthropogenic sources still being active, from a local perspective the river status is acceptable and the impact of sediment contamination on production and shipping services is negligible. The session continued with presentations from S. Heise and F.T. O’Shea addressing two potential sources of historic contaminants, namely floodplain backwaters of the Elbe River and historic landfills located in the inter-tidal zone within South-East England. According to the results presented by these authors, these contaminated sediments may become a secondary source of contamination under scenarios of climate change through their erosion and subsequent redistribution of contamination. The important pressure of urban activities to sediment quality was also discussed. The study of multi-decadal records of endocrine-disrupting compounds in the Rhône River points to both urban and industrial activities in the greater Lyon area as the principal contributors to the historical and present concentrations of these compounds measured in river sediments (B. Mourier). From a different perspective, P. Spadaro and K. Cronin presented a method to evaluate the quality and significance of stormwater discharges in urban waterways, a source that may be perceived as secondary but may have a dramatic effect on the recontamination of previously remediated areas. The session was closed by presentations on methodological developments in sediment quality and risk assessment. G. Breedveld discussed indicators of sediment variability connected to climatic conditions, which should help assessing the threads of release of natural and anthropogenic contaminants as a result of climate change, while J. Teuchies presented an exposure model to calculate changes in water and sediment concentrations in harbour environments. The use of such indicators and models should improve risk communication and understanding among stakeholders and ultimately facilitate the process of decision making in sediment management. It is well known that sediments and soils remain contaminated from mining activities even if these activities have been stopped since long. On the one hand, the immobilization of toxic metals such as mercury, cadmium, lead, zinc or copper is a welcome “service” of sediments. On the other hand, it has been proven over the years in many scientific studies that this immobilization may by far not be final and sediments may become a secondary source of pollution. The availability of contaminants depends on the environmental conditions which can change due to natural remobilization or human intervention. In the case of unacceptable risks management measures have to be taken. In the session (1) was demonstrated the possible extent of historic and recent environmental pollution due to mining at the example of the Wisla and Odra catchments, Poland, (2) were presented the results of a comprehensive assessment of mercury loading, fate and transport within a mining impacted watershed in the California Coast Mountain Range, USA and (3) was suggested a field-based approach to linking biological responses of freshwater organisms to sediment contamination by metals using a large data set from England and Wales, UK. Generally, studies on the (bio)availability of the metals focusing both on physicochemical aspects such as binding forms, fractionation, erodibility and organismic aspects such as uptake routes, bioaccumulation or food web magnification. Studies relating sediment contamination to the response of organisms in the field. Multiple lines of evidence studies to evaluate the transport and fate of contaminated sediments in watersheds considering both impacts on the ecosystem and on human health. The session “Sediment Remediation and Uses” was held on September 23. There were three interesting presentations on this theme. The first concerned the impact of ship propellers on the transport suspended sediment in harbors (Norway). This suspension of sediments transport phenomenon may be due to the anthropic activities (as is the case in the above subject), and can also be natural. The two other subjects justly concern the placement of sediment by different techniques in order to preserve natural resources and to ensure a continuous transfer of sediment. One technique which had permit The US Army Corps of Engineers to modify management practices with respect to dredged sediment. More emphasis was being placed on utilizing these sediments as a resource that can be applied to land and habitat loss in a cost-effective manner. The second technique is The ConSedTrans (Method-Continuous Sediment Transfer) with improved renewable power production. With the continuous sediment transfer method, sediments are taken from areas where they deposit unnatural to areas where the flow of the water is known to be big enough for quasi-natural transfer to the downstream area of the dams. There are three points close to dams that are possible: the base outlet or a side outlet for sluicing (not the preferred option, due to losing water). The second is the intake area of hydropower plants and the third option is the intake area of hydropower screws. With transferring deposited sediments to hydropower screws, the specific weight of the sediments can contribute to an even higher renewable energy production. This electric energy can be used to sustainably support the transfer of sediments in the reservoirs and therefore keep the rivers and the reservoirs in sustainable balance. In this session, seven knowledgeable and enthusiastic speakers presented the results of their studies on Sediment Fluxes and Budgets on River Basin Scale. Christophe Peteuil of the Compagnie Nationale du Rhône presented a view on integrated and cooperative management of fine sediment fluxes for the Upper Rhone River. He explained that as a consequence of man made changes in hydromorphology fine sediments can hamper the ecological functions of the river system. Sediment Management options for mitigating adverse effects on the (aquatic) ecology of the river system were investigated and evaluated. To tackle the problems it was decided to combine the options of sediment routing, ecofriendly flushing with a 3 year frequency and dredging. Axel Winterscheid of the Federal Institute of Hydrology in Germany explained about the use of Multibeam Sonars for measuring (and understanding of) sediment fluxes in the period 2004 – 2014. The results of the study showed that Multibeam data helps to understand sediment fluxes. So upcoming sediment management activities may benefit from this study. Rosalie Vandromme of BRGM, Orleans France, gave an overview of the project “Quantification of sediment fluxes in the Loire Hydrographic basin”. The purpose of the project is to examine the source to sink dynamics of the sediment cycle for the Loire River Basin. The results highlight that land management and lithology are the main factors that explain sediment fluxes. Anne-Cécile Denis of the Institut Scientifique de Service Public and of the University of Liège, Belgium, elaborated on suspended sediment and contaminant transport monitoring in navigable and unnavigable waterways. The project aims to help develop tools for the assessment of suspended sediment quality in order to make a long term planning of dredging operations possible. Different sample methods were used and it became clear that the gathered data can be used to establish the relation between suspended load and water discharge and it is also possible to characterize the transport of pollutants associated with recent sediments. Aleksandra Dewiszek of the University of Warsaw, Poland, presented the results of a literature study on the impact of the (massive) Three Gorges Dam on the sediment discharge of Yangtze River. Besides having an effect on the earth-rotation, the Three Gorges Dam also has a big impact on the sediment fluxes and budgets of the river system. Downstream of the TGD there is a abrupt gravel-sand transition. However also because of the scale of the study area, the identification and interpretation of hydrological and sedimentological changes in the Yangtze basin still is very complex. Thorsten Hüsener of the Bundesanstalt für Wasserbau in Karlsruhe, Germany, explained the audience about the hydraulic and morphological model investigation of the river Oder along the Polish-German border. The aim of the study is the development of an updated river training concept (groine design, etc) providing evidence to meet the nominal depth requirements for shipping and at indicating different side effects of training measures such as increased high water levels. For this also a scale model of the Oder River under study was made and used for experiments. In 2014 the project was completed and an updated concept for a river training system was delivered. Bram Ferket of the Antea Group Belgium presented a study on sediment fluxes to and in unnavigable waterways. The study was done for the Flemish Government and aimed at the development of a policy for sediment control in Flanders. Two models, one for soil erosion and one for sediment transport were combined. Model results showed that sediment fluxes and soil erosion are directly connected. In the near future the model will be improved. A policy for sediment control still has to be developed and implemented. When wrapping this up it must be concluded that in this very entertaining session a wide range of hydromorphological problems, mainly due to human interventions (e.g. hydropower dams, land-use), were highlighted on different scales. From very large Rivers to agricultural Ditches, and from the Mountains to the Sea. Field measurement methods were presented as well as modeling-methods both mathematical and physical (scale model). During the session “Building with Dredged Material and/or Sediments” speakers showed that hard work has been delivered over the last years (to decades) to improve the reuse of sediment and dredged materials in a wide range of applications. It was clearly shown that dredged material can be a valuable alternative resource and can be integrated into the circular economy. A management decision process of beneficial use of marine sediments in civil engineering practices, which was carried out within the framework of the CEAMaS project, was developed. Based on (1) the legal framework (which varies over countries) and (2) the physical, chemical and mechanical properties, the system allows to select the most appropriate treatment process and reuse options. In the framework of the “Sédimatériaux” approach in the Nord-Pas de Calais region a methodology was developed that allows to reuse dredged material taking into account the national regulations, and this in several sectors, some of which are rather recently introduced (like agricultural amendment, artificial aggregate). For fine dam sediments in France a user-friendly decision support tool to pre-select beneficial use was developed, based on relevant technical criteria and minimal characterization. This resulted in suitability indexes for six different beneficial uses. In the project “Lift-up of Lowlands” dredged material was spread out in thin layers on the land adjacent to the waterways. This is an example of a cost effective and environmentally friendly way of reuse and was in addition integrated in watershed planning processes and regional strategies for sediment management. The special session on fine sediment impacts on aquatic ecology was well attended. The presentations covered various aspects of characterising and mitigating fine sediment pressure on the aquatic environment, and developing new indices for aquatic biological response to those pressures. The combination of talks, questions and discussion point towards the impact of modern day catchment use on elevating fine sediment pressures on the aquatic environment, the variable performance of mitigation measures in both space and time and the need to combine on-farm mitigation measures with channel restoration interventions for delivering greater impact / more sustained outcomes. With this special session, we wanted to raise interest in the topic of sediment properties and impacts that change when the environmental parameters are altered. In addition to physical and chemical properties, that can be affected when e.g. salinity, hydrodynamic conditions, pH, UV radiation, or oxygen concentration change, there are likely to be consequences for its ecosystem functions. This will especially be the case if the sediment is contaminated and bioavailability and toxicity are affected. Circumstances with the potential to change the environment for sediment can be natural regular processes, extreme events such as floods or anthropogenic activities. The diversity of drivers comprise e.g. climate change, river basin management and economic benefits. These three topics were presented during the special session in Krakow, which then focussed on the first subject. Thirteen people attended the session, people with different backgrounds such as civil engineering, agronomy, marine and coastal engineering, biology, geochemistry etc. It became clear early in the discussion, that different disciplines had different perceptions of the difference between soil and sediment, that different definitions are around and – depending on the management issue – different classifications are followed. Also diverse was the range of topics that participants thought should be tackled during the first workshop that is currently planned to take place in late spring 2016. As a practical way forward, it was decided to focus on a small number of management issues that foster the transition from soil to sediment and from sediment to soil, and within this scope identify and discuss those processes that we should know about and currently do not. Improvement of soil quality through sediment amendment. In order to facilitate the exchange among those that are interested in the topic of the work group and in participating in the workshops, we are organizing a LinkedIn discussion group called “sediments in a changing environment”. Everybody interested is kindly asked to look for the discussion group on the LinkedIn platform and send a request for invitation. Preparation of a review on the topic of soil-sediment-soil by all interested participants of the work group which will serve as preparatory material for the workshop. Building trust with a broader public on complex issues is always a difficult challenge. At the same time finding ways to communicate with the relevant group of people on the right level is becoming more and more of an issue. The special session was designed around a recent case implemented at the Elbe estuary in Germany where sediment issues are of major relevance. The session was opened by Adriaan Slob’s presentation on “Trust and Policy Processes”. Everywhere where people are collaborating, trust is an important carrier for that collaboration. More important, one has to understand that it is difficult to build trust but easy to lose it. In a brief overview on the Elbe case, presented by Henrich Röper, it was shown, how a stakeholder involvement was conducted in a process that started in late 2013. A group comprised of 40 regional stakeholders (environmental NGOs, business representatives, Ministries, communities, fishery and tourism organizations) was discussing future options for sediment management, the role of sediment remediation and river engineering measures. Within 16 meetings more than 35 measures have been identified, discussed and assessed. In an open discussion both presentations were discussed very lively by the 30 participants of the session. Among other issues the participants highlighted the role of university involvement, communication and transparency, availability of information, the importance of a common vision and the clarity of decision flow. It was obvious that the SedNet community has plenty of experiences to share on how to build public trust and will for sure continue to talk about “sediments and society matters” on future occasions. There was a lot of interest in the Sediment Discharge Test. Over 20 participants from 7 countries attended the workshop. The Sediment Discharge Test (SDT), consisting of an Excel-application and a Guidance Document, has been developed in The Netherlands by Rijkswaterstaat (RWS) and Deltares. The SDT enables its user to assess the effect of an increase of chemical substances released from contaminated sediments due to a physical intervention on the chemical water quality objectives of the Water Framework Directive. This increase in “discharge” of substances may not lead to “deterioration” of the water quality. Deterioration, as defined by the Water Framework Directive, means that the water body may not deteriorate from one class (a good status) to a worse class (a bad status). The limit between these two classes is set by the water standard. The allowed discharge, whenever a water body has a good status, is therefore determined by the difference in the current water quality and the water standard. If a water body however has a bad status no deterioration is allowed at all. The way how the Dutch regulate discharges was of particulate interest to the participants. Deltares and Rijkswaterstaat explained how the Excel application of the SDT may be used and what kind of data is necessary. The participants were pleased that the tool enables the user to enter any type of measurement. The tool recalculates the contents in the sediments or the concentration in the water phase to the right matrix. Besides, Deltares explained what kind of standards are used and how the participants may alter this for their own national standards. All participants experienced the tool by executing some exercises for which three cases were designed. The participants thought the tool easy-to-use and already came up with a lot of ideas how to use the SDT in their own country. Some participants thought the SDT would contribute to determining the allowed quality of relocation sites for dredged material. Others would like to use the SDT in order to assess the impact of capping or remediation of certain parts of the sediment. At this moment the test for “no deterioration” is only performed in the SDT if the sediment quality after the physical intervention is worse than before and if this “new” sediment quality exceeds a test limit. For international purposes this test limit might be omitted, allowing to asses any kind of deterioration in sediment quality and its effect on the water quality. For the purpose of assessing the effect of an improvement of the sediment quality Rijkswaterstaat and Deltares will evaluate the possibilities and consider modifying the tool, since they are enthusiastic about applying the tool in this kind of situations. Not only the participants were enthusiastic about the tool, Rijkswaterstaat and Deltares were very content about the input gained from the participants, so many thanks! During the conference 40 posters were presented on miscellaneous sediment issues. Two poster corners were dedicated to specific themes: 1) Sediment Management and 2) Polish issues. The poster corner session around the topic “Sediment issues in Poland” was organized the 24th September around lunchtime. Seven posters were shortly presented by their authors related mainly (but not only) to sediment quality issues and metal pollution in particular. The case studies discussed at this time included the Sącz basins, the Oder River system, which still presents sediment metal concentrations that may pose a risk to the environment, and the Przemsza, a tributary of the Vistula River that flows through the highly industrialized Upper Silesia region and has strikingly high sediment metal concentrations. As pointed out during the discussion, metals appear as a priority compared to other types of contamination although little action has been taken so far at the sites at issue. Some options were discussed such as the textile tube dewatering, which potential to contribute to solve contaminated sediment problems in Poland was presented. The poster corner was also a good platform to present the Polish case study for the project Soils2Sea, project financed by BONUS-185 (the International Programme for the Baltic Sea). Soils2Sea aims at reducing nutrient loadings from agricultural soils to the Baltic Sea via groundwater and streams. The contribution presented at SedNet was the Kocinka catchment, mainly agricultural, and the nutrient dynamics in water and sediments. The results should be used to model nutrient transport and ultimately inform potential management options that decrease the threat of eutrophication to the Baltic Sea. For the information about the winners of poster prizes, we refer to the intro of this conference report.